Will sponsors abandon FIFA as accusations grow? Additionally, a fresh investigation into migrant worker conditions in Qatar landed BBC reporters in prison recently. It is yet another case of extremely bad PR and negative news for FIFA and the host country of the 2022 World Cup Finals. The tournament, as well as the organisation more broadly has been beset by controversy and murky stories. The date of the event has already been shifted to winter 2022, as it would have been impossible to play in the stifling heat of a Qatari summer. Allegations of corruption in the bidding process have also blighted FIFA and its President Sepp Blatter. Far more seriously, there has also been a human cost. For thousands upon thousands of migrants that are in the country employed on various building sites, working and living conditions are said to be insufferable, and on occasion deadly. Several FIFA World Cup sponsors - most recently and notably, Visa – have urged the football management body to improve the conditions for those working on constructing stadia in preparation for the tournament. They say that they ‘continue to be troubled by the reports coming out of Qatar related to the World Cup and the migrant worker conditions’. To be associated with such practises could be bad for brand perception. However, according to YouGov BrandIndex data, Visa is currently seeing an improvement across many metrics in the UK. 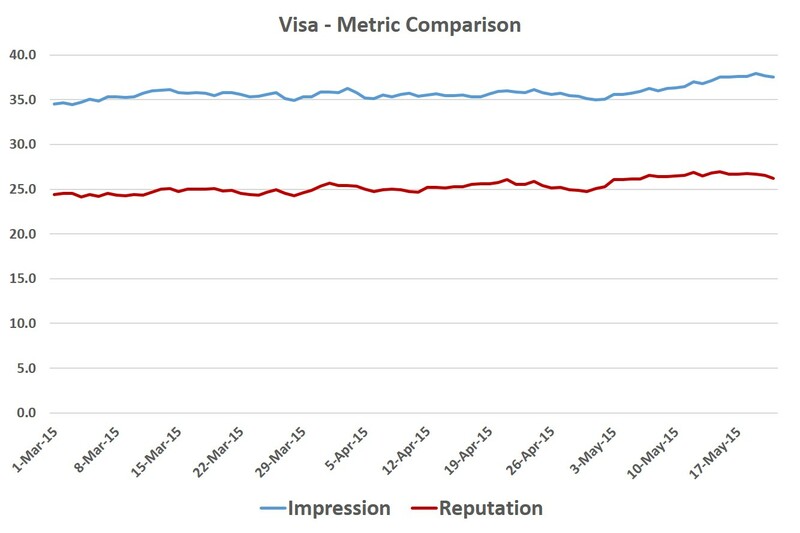 Visa’s Reputation metric has been steadily rising over the past three months, and has a healthy average score for that time of +25. What’s more, consumers currently have the most positive impression of the brand in that time. Their Impression score is at +38 at the moment. The worry of course, not just for Visa, but for other sponsors including Coca Cola and Adidas, is the effect being associated with an event that might generate more negative than positive press might have.. The other point of interest is whether FIFA will now feel obligated to do more to improve conditions for those working in Qatar, and not simply suggest its isn’t their responsibility. The news this morning will add even extra pressure to those associated with FIFA. If charges are successfully brought, there will be surely no way such large scale companies will continue to lend their name to major tournaments.